This necklace is a flawless beauty. 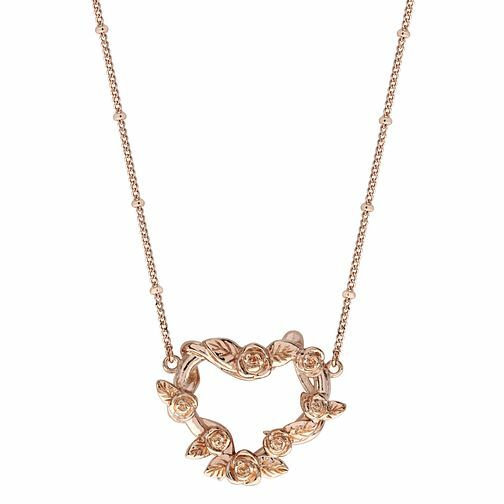 Rose gold plated, this stunning design depicts a heart pendant, carefully and creatively crafted out of delicate roses. A tale as old as time, this pretty pendant is placed upon a fine rose gold tone chain. A simply stunning piece, perfect as a present for any Disney devotee! Ever After Disney Rose Gold Plated Belle Rose Pendant is rated 4.5 out of 5 by 2. Rated 5 out of 5 by Anonymous from Perfect for the price. Brought as a Valentine's gift for my girlfriend, we don't have much of a budget to work with but this price fit in well with that and she loves it, hasn't taken it off for 2 weeks. Rated 4 out of 5 by Anonymous from Vet pretty Preferred if necklace was gift boxed rather than a pouch, chain looks flimsy otherwise excellent value for money.